A famous, critical father and devoted, mysterious mother conceive a startlingly unusual child who travels the worlds of 1960’s Hawaii, 70’s San Francisco and 80’s rural California in a search for identity, truth, and love. Life is so exciting these days. Wendy and I finally got our dog rescue legal! Some fans didn’t get to see this so I am trying Re Blog. Maybe the links will appear for those using screen readers. We live in a small town. Ten thousand plus, spread out over more than a dozen communities around a lovely, but fake, lake. The small space which used to house a flower shop, was well hung, and dominated by art with local themes, From industrial car-paint drip art, to painting on animal skulls and shells, to my personal show favorite discovery: 86 year old Joan Montano Grant, whose retro style is heart-rendingly persona, evoking War- era magazine illustrations; yet her living subjects, from poets to ponies, have enough personality to jump off the canvas. There were exquisite woven baskets and painted gourds from local tribe members. Striking oils of Arabian desert people; gorgeous and sensuous glass works. Intricate wood scroll art depicting California wildlife. There was even controversy: an artist who was asked to move her paintings due to their subject matter. 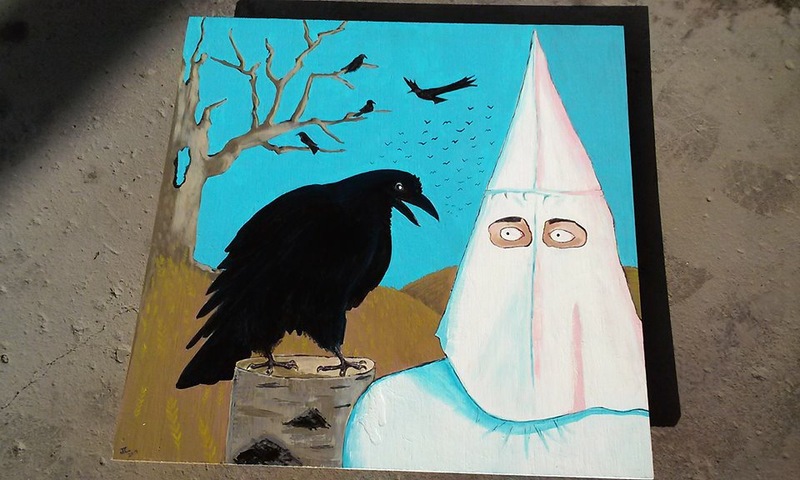 Jennifer Colley’s painting “A Raven Scolding the Klansman, Kah Kah Kah!” offended some of the artists whose work was also accepted into the show. 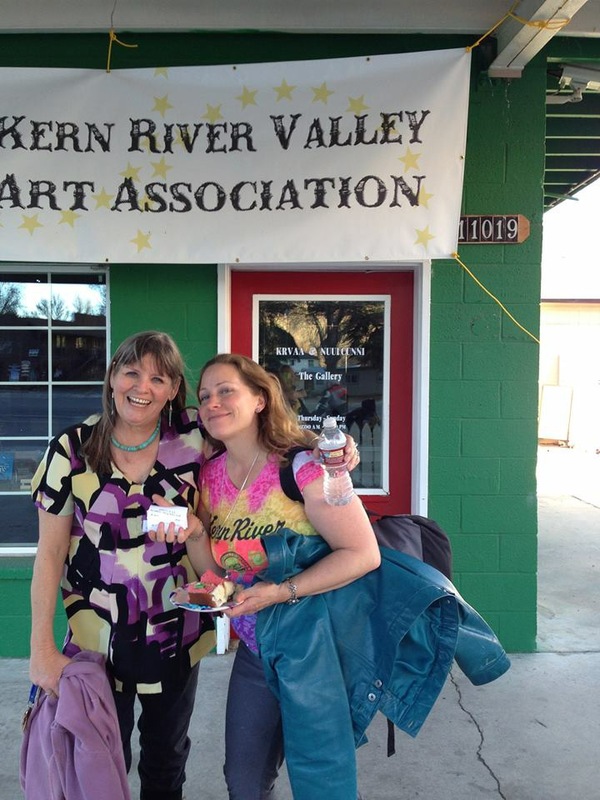 Colley, Vice President of the KRVAA, responded by transforming the outside space into as much a gallery experience as inside; and despite having to mount her controversial painting on borrowed wood pallets, sold it before the event concluded, to the private collection of artist Kelly McLane. There was music by OMG, raffles, great wine, comfortable chairs and food. When a Saturday afternoon provides this kind of social and cultural thrill, all was missing was a great restaurant with any food not based on beleaguered cows, pigs and chickens, which we would rather pet than eat. If only there were a food truck slinging veg Pad Thai that we could take with a couple beers to an outdoor table we would have achieved Saturday Nirvana. Home, without a fifty dollar cab ride. 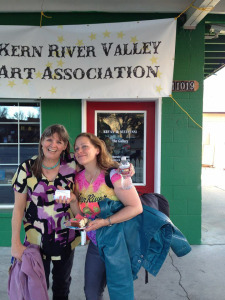 I spent my day with art, artists, and friends. 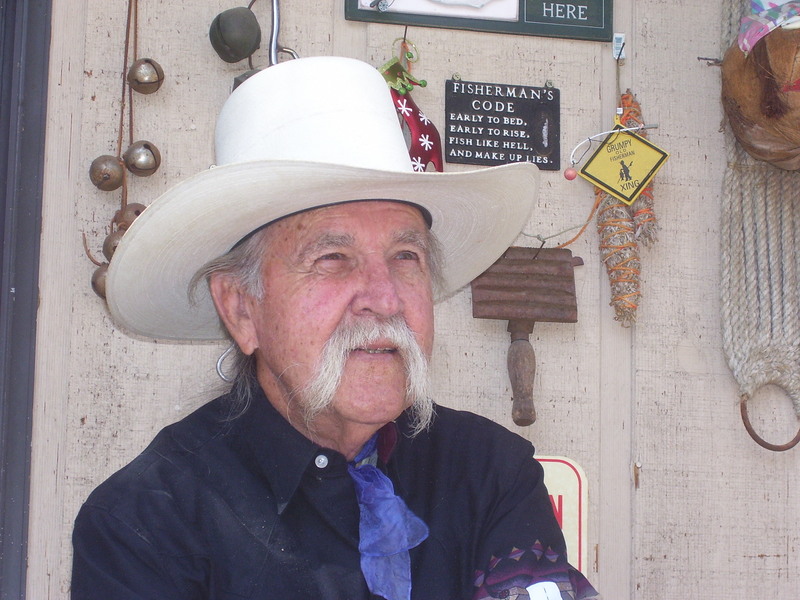 I love the big city museums and galleries – but equally: Kernville Rocks.